I'm working 9-5, five days a week, so any rental riding has to be on the weekend. I'd been considering the Kuangxi Waterfall, a destination tuk-tuk drivers are constantly offering, about 30 kilometers outside of town. I visited the waterfall on my first trip to Luang Prabang three years ago. It was the most beautiful waterfall I'd ever seen: limpid pools of turquoise green, with smooth white chutes falling in terraced levels. The day I went, we arrived early and had the pools to ourselves for a short while, then the best swimming spots filled up with tourists while dozens of Lao families brought picnics to the forested surroundings. I remotely checked the route, through my husband, unable to look up the terrain without my laptop. He described two major hills on the way there, which are also mentioned in the guidebook. I knew an 18 mile ride with climbing on a rented mountain bike would be a challenge, but I considered the reward of the waterfall, and that the trip home would be "downhill" (cue foreboding music). Saturday was already hot and sunny at 8am, but I was eager to try going somewhere, and I have a limited number of weekends here, so I couldn't resist renting the bike. Once I weaved my way beyond the excruciatingly slow Luang Prabang traffic of motorcycles, cars, and pedestrians, it felt great to be on a bike with gears, able to push the pace and make tracks through the landscape. I passed one guy in Serious Cyclist gear as I left town, who gave me a thumbs up. The road climbed gradually, past thinning mechanic and general goods shops, domestic dirt yards with roosters and children, construction sites and open lots. The dusty town gave way to agricultural fields and green, green hills. Much of the road was shaded at this point, and it made for enjoyable riding. Soon the first big climb began. It had been described as 400 feet in 2 miles, which I realized is quite similar to one of the climbs back to our house, up along Discovery Bay. I wished my water were more accessible: I had to stop in order to get a drink, and I kept waiting for a patch of shade. Finally there was shade, and the top of the hill, with a group of French-speaking people on a cycling tour having a break. After some water, I headed down the hill, passing an overly cautious car and settling into a section of mostly-flat with rollers. This part reminded me of the agricultural valleys near Port Townsend, except that the surroundings are tropical rather than temperate - banana trees rather than Douglas fir. Riding a bike gives a more intimate experience of the Lao countryside and the villages one passes through. There is time to examine the wooden houses, to appreciate the river running alongside, to wonder at the dramatic, lush mountain ridges. And there's always the possibility of stopping at will, as when I noticed a proliferation of looms in a village near the waterfall, and stopped to admire and photograph some work in progress. I'd tested the gears on my bike in town, making sure they were all functional, but once I was out on the road, the front derailleur turned fickle. Occasionally it would ease the chain onto the smallest ring, but more often it would get stuck between, and I'd have to shift back to the second chainring. This, of course, was only discovered in times of need, and made for some awkward attacks on hills. I count myself lucky that the gears cooperated on the final approach to the waterfall, which would have been impossible otherwise. That last, intense climb snakes up through a busy village full of children, and it felt as steep as the Basque village I'd watched a cyclist climb as a stunt on YouTube: turn after turn, going at near walking pace. I kept expecting children to tease or run along next to me, but thankfully they ignored me. When the road straightened, I recognized the end, the strip of juice shops and restaurants leading to the waterfall entrance. There was nothing on my mind but getting into the water. I paid the entrance fee, drenched in sweat, prompting the ticket man to say "Very hot - swimming good!" Entered the park like a zombie, walking straight past the bear rescue center and up to the first pool of water, which I noticed was muddy brown and churning. Of course. Rainy season, every river is muddy. The limpid pools are a different time of year, but no matter, I was going in that water. Changing room, bathing suit, and in I went, the water bracing and refreshing, despite its muddiness. Absolutely no one else was swimming, which made me a bit of a spectacle, but I didn't care. The cool water pulsing against my back was the opposite sensation to my long, hot climb, the antidote. Return trip: at one o'clock in the afternoon, the heat was fierce. The road collected and magnified heat, and each little patch of shade felt drastically cool by comparison, a quick breath of freshness, instantly dispersed. This road was way hotter than the fresh black asphalt of Whidbey Island in August, which my father-in-law likened to walking on coals. This was more like swimming through coals - a complete surrounding of heat. I looked at the shaded sides of the road longingly, imagining a parked bicycle and a nap in the shade. But each time I stopped to drink, I found the cool of the shade deceptive, for as soon as I stood still, the breeze of riding ceased and the sweat could flow freely. There was nothing for it but to keep going, even though each minor bump or incline was a slog, and climbing back up the main hill nearly did me in. I couldn't fathom why I'd forgotten that I would have to go back over the hill I climbed in the morning. What made me think the return trip would be easier and mostly downhill?? The only elevation saved on the way back is the final climb to the falls, which was a distant memory by the time I was halfway back. As I neared Luang Prabang, the kilometer markers by the road counting down: 9,...8,...7, I began fixating on orange Fanta. I'd tell myself I could stop at the next roadside shack selling cold drinks. Then I'd pass one, unconvinced. Memories of India made me wary - whenever we were most desperate for a cold drink, we'd end up at a place without a working fridge, or they'd have just put the bottles in to cool recently. Electricity is more reliable here and now than 20 years ago in the mountains of northern India, but my caution remained. Not to mention my need to simply keep going, to keep putting kilometers behind me. Every glimpse of liquid refreshment beckoned, even bottles of water (while I still had water in my own bottle). I remembered such fantasies from other long rides or tough indoor classes: promising myself I could drink All The Things as soon as I was done. 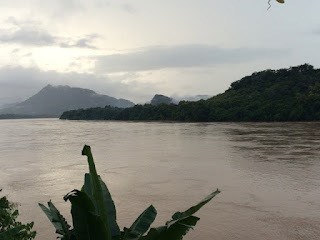 Just when I thought the persistent inclines would never cease, and would ultimately get the best of me, I came to the sweeping view of the bending river, with Luang Prabang spreading beneath Phusi hill's golden pagoda. Still five kilometers away, but below me now - the way was at last downhill. 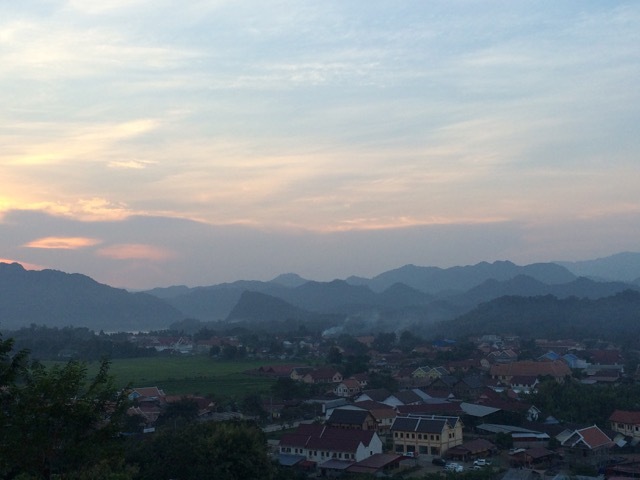 View of Luang Prabang at sunset - I wish I had a photo of the view described above, but no. As I re-entered town and the shops and traffic thickened, I pulled up short next to a small, shady shop/house with big, promising fridges full of soda. Chose and downed an orange Mirinda, while huffing and dripping in the nice people's little space. 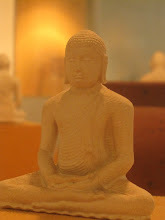 A small boy was summoned, who greeted me "Sabai Dee!" with hands together. Then he surprised me with "How are you!" in the same tone, with the same gesture. Otherwise, I was pleasantly ignored and left to drink and sweat and sit in their doorway. I appreciate the Lao acceptance of foreigners with our strange ways, the tendency to let us be - a contrast to the staring and questioning in India. Fortified, I rolled on into Luang Prabang, fully finished with being on that bike. Even taking it back to the rental place later was painful. I'd learned how much difference a small thing like the height of the handlebars can make. Not to mention the fickle gears! Next weekend I'll have to choose a different bike. Also learned that if it seems too hot to ride at 8am, it probably is.